Outfit your living space with this beautiful coffee table. It is finished in a warm brown oak to liven up any room. 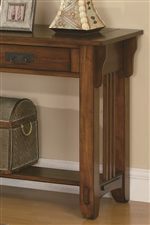 The table top features stunning butterfly knot inlays for visual accent, and plentiful storage options exist. Two drawers provide space to tuck away smaller items, while a lower shelf adds room for accents and decor. Charming with just the right details, this is a lovely occasional table for your home. The Occasional Group 2 Drawer Coffee Table with Shelf by Coaster at Furniture Discount Warehouse TM in the Crystal Lake, Cary, Algonquin area. Product availability may vary. Contact us for the most current availability on this product.